If you are looking for a smart speaker with excellent audio quality but small enough and beautiful enough to blend into any room decor, the Google Home Mini is your answer. I have no problem recommending it, even if Google Assistant still has room to grow. The hardware of the Home Mini is excellent, thoughtfully designed and works great. In the year since its release, there is little room for debate on the growth that Google Home and Google Assistant have seen. The smart speaker has sold well and with brains behind it, Assistant, has continued to grow in abilities on what it can help you with in your day-to-day. I’ve had a Google Home in my home office for nearly a year now and it is so integrated into my day that I can hardly see not having it around. If there has been one challenge with Google Home, it has been the size. Don’t get me wrong, it’s not huge at just under 6″ tall, but it is noticeable if you have it in a bedroom or family room. That is where the $50 Google Home Mini comes into the picture. Standing only 1.65″ tall and covered in an elegant fabric, the Home Mini is designed to go into various rooms of your home and just be there unobtrusively. It is designed to blend in but remain always available and provide excellent sound quality. The Google Home Mini truly is for the masses because of all of this and a price point that is hard to resist. The Home Mini is, in many ways, a shrunk down version of the standard Google Home which means that the specifications are not a disappointment. It measures 3.86″ in diameter and a height of 1.65″. That is 98mm and 42mm respectively in new money. 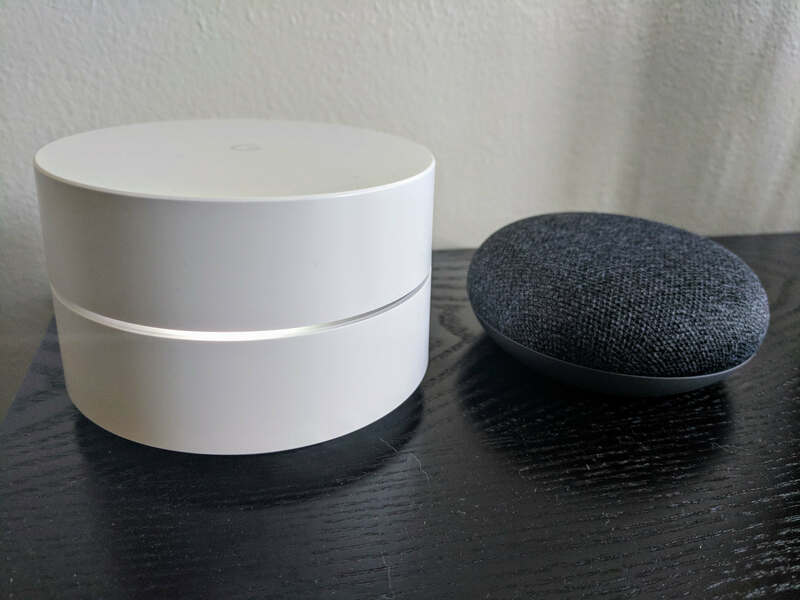 Google made a big deal during the launch of the Home Mini that it was roughly the size of a donut and that is reasonably accurate. For hockey fans, it’s just slightly larger than a puck. You get the idea – it’s small. Weight wise, it is 6.1 ounces or 173 grams. The top of the smart speaker is covered in cloth which Google spent thousands of iterations getting right so it would not dampen the speaker or the microphone. The fabric is available in three colors – Charcoal, Chalk and Coral. The Coral color is only available from the Google Store. On the top under the fabric you will find the four LED indicators of the smart speaker. These light up to give you an indicator of Google Assistant hearing you, thinking or your volume level. The base is made of recycled plastics with a non-skip silicone plate at the bottom. 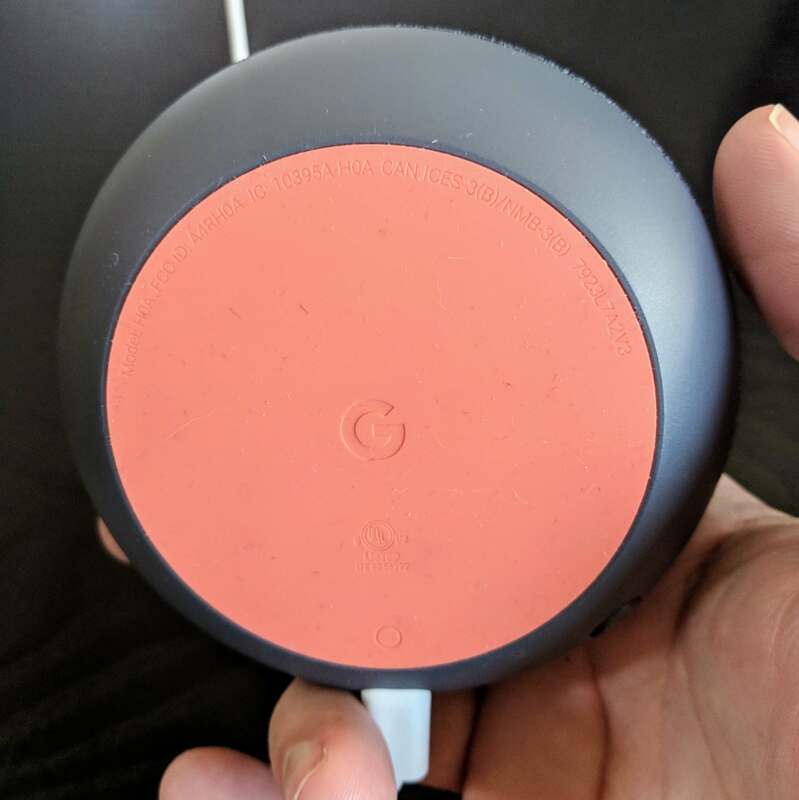 On the edge of the base is where you will find the MicroUSB connector to power the Google Home Mini. The 4.92′ (1.5m) power cord is included. You will also find the physical microphone mute switch for the device to prevent it from responding to voice commands. Inside the Home Mini you will a far-field microphone array that is similar to that you will find in the first Google Home. The Mini supports 360° sound that is powered by a 40mm driver. As for WiFi connectivity, 802.11b/g/n/ac is supported on both 2.4GHz and 5Ghz. Chromecast and Chromecast Audio is built-in and Bluetooth is supported too. Setting up of the Home Mini is very easy. First, make sure that you have the Google Home app on your phone and are signed into your Google account. When you have done this and plug in your Home Mini, the app will find the device and give you a notification on your phone. Tap it and you will be walked through the setup process. In all, it takes less than 10 minutes to complete and you can train Google Assistant to learn your voice during the process to give you personalized results. Much like Google Home, the Home Mini has touch controls to control the speaker volume. However, unlike the top dial-style touch controls of the Home, the Home Mini has volume controls by tapping the left or right of the fabric top. As you increase or decrease the volume, the LEDs on the top of the device will brighten or dim as you go up or down. The question of if this is a big deal is up for debate. The decision to remove the touch functionality may seem extreme at first blush but Google has always taken privacy seriously. Clearly they don’t think they can address this with the current hardware configuration of the new Home Mini so instead of risking privacy issues (translation: lawsuits), they are simply going to kill the feature. Personally, I don’t think it is a big loss as most users of Google Home today are already use to the “OK Google” command to activate Google Assistant. I’m not going to cover Google Assistant in depth for this review as it has been covered multiple times by me and other reviewers. The bottom line is that Google Assistant continues to grow in ability, understanding, reliability and skills. I highly recommend readers bookmark this page for updates to what Assistant can do for you. Make no mistake however: When it comes to integrations with smart home devices, Amazon Alexa (via the Amazon Echo) is more complete. Google is closing the gap, rapidly, but it is still behind. One of my biggest concerns with the new Google Home Mini was around the audio quality. 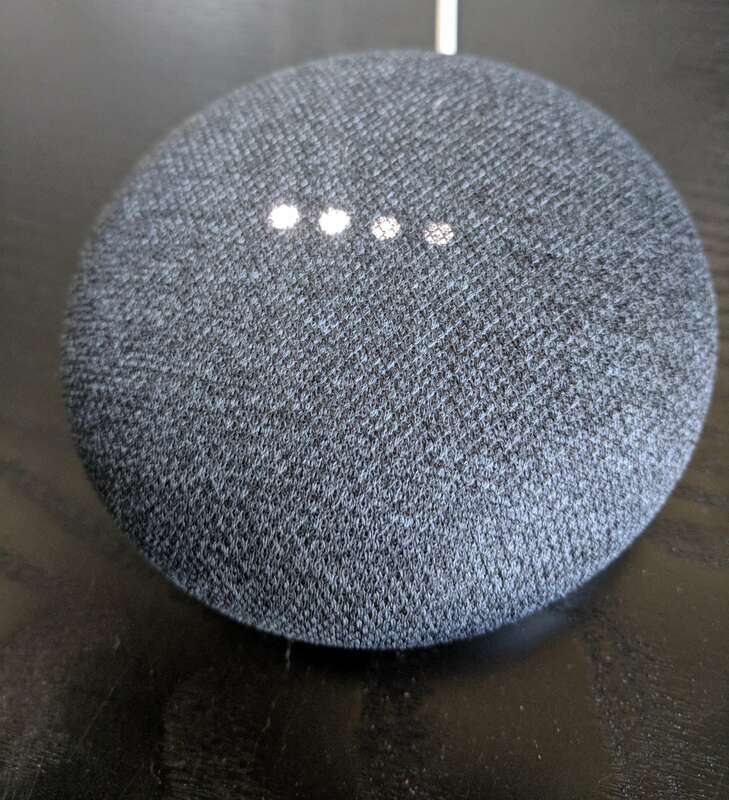 Google Home has fantastic sound quality with rich sound throughout any music range and because of the size, I assumed that the Home Mini would suffer from not-so-great sound quality. Happily, I was wrong. The Home Mini has excellent sound, more than adequate for a bedroom or office space. No it won’t fill the room quite like the regular Google Home – and certainly not to the level of the Google Home Max – but it gets the job done well. If you are looking for a smart speaker with excellent audio quality but small enough and beautiful enough to blend into any room decor, the Google Home Mini is your answer. I have no problem recommending it, even if Google Assistant still has room to grow. The hardware of the Home Mini is excellent, thoughtfully designed and works great. If there is one thing physically I’d change it would be the mute switch which somewhat sticks out and has a “doesn’t belong here” look to it. But given I rarely use this on my regular Google Home, that isn’t a show stopper for me. Audio quality is wonderful out of the Home Mini too. If you are looking for a great gift idea for the upcoming holidays, the Google Home Mini fits the bill. The Google Home Mini is available from Google directly and a wide range of retailers for $49. Remember that if you want the new Coral color, that is a Google Store only option.